aside from my professed skills with adobe photoshop, i have slightly lesser abilities with adobe's accompanying vector graphics software: illustrator. sadly, i don't have as many opportunities to work in this environment as i'd like, but when there was need of designing a cycle jersey for debbie's café several years ago, illustrator was the perfect design ploy. but before we go any further, let me point out that i did not then, nor do i now, consider myself adept at jersey design. i basically created an outline that bore some resemblance to a short-sleeve jersey then filled in the blanks. text, colours, logos all placed where i thought they ought to be prior to sending the file off to those about to turn my graphics into real, wearable jerseys. there is little more cheering than undermining weeks of apprehension when a large cardboard box arrives filled with the real thing, looking even better than those vector graphics on the imac. thankfully, the person on the receiving end of my electronic dabblings had both the knowledge, skill and even better software capable of translating all into the various panels that would allow for several differing sizes of jersey without so much as a misplaced seam. were i to have considered setting up my very own cycle clothing company, i confess i'd be thoroughly clueless as to how one ought to go about it. the second part of that hypothetical equation is why on earth i'd harbour any notions of entering a virtually saturated cycling apparel market in the first place. though the rhetoric that it was hard to find the very style and fit of clothing one had in the mind's eye once held a modicum of truth, that's hardly a credible statement nowadays. which rather makes you wonder why casquette supremos this is cambridge thought it a wizard wheeze to offer jerseys and socks in the first place? "The reason for us was customer request." according to andrew at this is cambridge. "When are you going to make jerseys was a frequent ask, naturally leading to the cap, jersey, sock combo." that in itself is probably one of the few decent reasons left for an outsider to join the party. any business worth its salt would do well to heed the more reasonable requests from an established customer base. "The current releases are part of a limited edition project designed to accompany our handmade caps and sock collection." there is no doubt that a matching jersey, socks and cap ensemble very much helps project the ideal corporate image on the sunday morning ride. in a minor variation on the 'flatter to deceive' mantra, i was sent the 'wrong' size of jersey. i consider myself a medium sort of fellow through and through, but through the ever more confusing medium of e-mail, the brightly decorated jersey that arrived was marked up as a 'small'. it would have been inept of me to throw a strop and complain unreservedly to the folks in cambridge, so i tried it on first. and blow me down if it didn't actually fit. i have not become any smaller over the years, and i still think a medium size would have been slightly more appropriate. however, there was no denying that, despite a slight shortness in the front, the jersey's constitution offered no physical restrictions whatsoever. according to andrew at tic, he'd found it necessary to move up a size; the jerseys are based on bioracer's top of the race technical speedwear and offer a particularly athletic fit. though it felt a tad awkward when stirring the porage at breakfast on sunday morning, the minute those arms stretched to reach the brake hoods, it immediately felt like a second skin. the full-length front zip tops out on a virtually collarless design jersey. the lack of a zip garage promised/threatened to become something of an irritation, but once the colnago was out the bike shed, i forgot all about that until writing this review. the sleeves are of commendable length and close-fit. 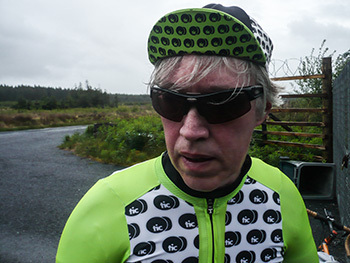 you can see why bioracer term this as speedwear, for there is scarcely a panel of polyester that would find any opportunity to indulge in flappage, no matter the strength of the headwind. the three rear pockets are sadly not accompanied by a fourth zipped security pocket and though wide enough, they could perhaps have offered a smidgeon more depth. having come close to overheating only the other day, i rolled up my stowaway jacket to pop into the centre pocket, but felt rather more was left uncossetted than i'd have preferred. in mitigation, it stayed firmly put throughout a subsequently less than billiard flat ride; perhaps i complain unnecessarily. the matching cap offers every bit the comfort and perfection of sizing that has been the tic watchword from day one. if white and lime green is not quite your comfort and joy, the whole kit and caboodle can be ordered in black and lime green which is arguably less ostentatious. a quirky quirk displayed on the matching socks is the appearance of a logo on the front of one, but on the rear of the other. i like quirkiness. 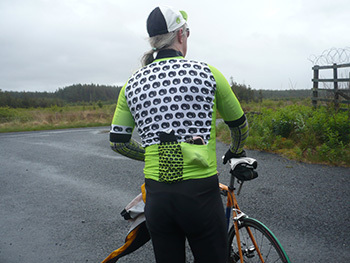 the kit's incredible lightness of being, coupled with an hebridean climate that has yet to equate to summer entailed matching it with a pair of armwarmers on each ride and covering it with a cosy waterproof jacket on another. it's not my usual modus operandi to review summer wear in the teeth of an atlantic gale, but more often than not, needs must. as one with a declared lack of skill and expertise in the area of cycling apparel design, i would tender that this is cambridge might consider offering armwarmers of their own, and perhaps even a matching pair of bibshorts. however, every journey starts with but a single step. or three. this is a particularly commendable introduction. a 'this is cambridge' ltd edition tom s/s jersey retails at £99. the matching cap costs £24.50, while a pair of tall socks rounds the whole set off at £13.50.